Contains minutes of general meetings, annual general meetings, emergency meetings, extraordinary meetings and special meetings. 27 Jun 1892 it was resolved that the new ground would be called Goodison Park. Various arrangements for the opening of Goodison Park by Lord Kinnaird on 24 Aug 1892 are recorded. 25 July 1892 minutes contain a list of shareholders - other lists throughout the volume. 21 Mar 1893 records the line up of the team against Wolverhampton Wanderers for the F.A. Cup Final on 25 Mar. 28 Jan 1895 the committee set out their terms for the purchase of Goodison Park. 22 Mar 1895 it was agreed to buy the ground. 10 Jun 1895 the resignation of 5 directors including George Mahon is recorded. 1 Aug 1895 William C. Cuff was voted onto the board of directors. 12 Aug 1895 Goodison Park was purchased by mortgage. 25 Nov 1895 it was agreed to create a sub-committee to investigate the working of the turnstiles. 5 Mar 1896 it was agreed to build a new stand. Minutes signed by George Mahon, W. Jackson, William R. Clayton, Frank Currier, A. T. Coates, John Atkinson, John Prescott, Dr. James C. Baxter. "Results Season 1891-92"pasted on inside of front cover. 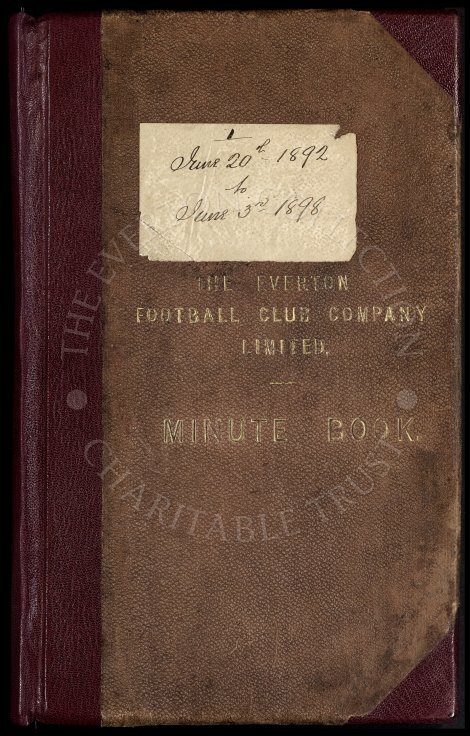 Pp.49-52 from the "Athletic News Football Annual" giving Everton's results for the season 1892-93. The results for seasons 1893-94, 1894-95, 1895-96 and 1896-97 are pasted on front flyleaf. "Season 1892-93 Bye-laws" pasted in after minutes of 11 Jul 1892. Letters giving notice of the AGM including balance sheet pasted in next to the minutes of the A.G.M.s held on 26 Jun 1893, 18 Jun 1894, 5 Jun 1895, 2 Jun 1896, 11 Jun 1897 and 3 Jun 1898. A plan of the Goodison Park ground pasted in opposite minutes of 21 Mar 1895 and opposite the minutes of 22 Mar 1895 an "Epitome of Contract". "Rules as to Training" pasted in after minutes of the meeting on 26 Oct 1896. 91 F. Geary appeared before the directors concerning his behaviour towards the spectators. 113 Agreed to give a match at Goodison Park for the benefit match for the unwaged. 132 Resolved that a letter be written to Porcupine saying the explanation re: stoppage of draws is not satisfactory. 208 Parry suspended. Notice of his suspension to be posted on in the dressing rooms. 211 Reserve Team to have a gold medal each. 286 Resolved that Elliott be engaged as Assistant Trainer & Groundsman to play when required. 295 Resolved to give Stoke £20 for the transfer of Maxwell & to find him a place in a solicitors’ office. 444 Resolved that the Ground Committee be authorised to have rooms covered over, urinals erected etc.